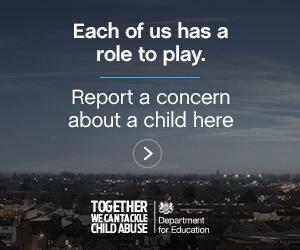 The County Council is supporting a national campaign launched on 3 March by the Department for Education to encourage members of the public to report child abuse. Appearance – such as frequent unexplained injuries, consistently poor hygiene, matted hair, unexplained gifts, or a parent regularly collecting children from school when drunk. Behaviour - such as demanding or aggressive behaviour, frequent lateness or absence from school, avoiding their own family, misusing drugs or alcohol, or being constantly tired. If you suspect child abuse or neglect, please click on the button below.